Hybrid photonic integration combines complementary advantages of different material platforms, offering superior performance and flexibility compared with monolithic approaches. This applies in particular to multi-chip concepts, where components can be individually optimized and tested. Up to now the assembly of such systems, however, requires expensive high-precision alignment and adaptation of optical mode profiles. We show that these challenges can be overcome by in situ printing of facetattached beam-shaping elements. Our approach allows precise adaptation of vastly dissimilar mode profiles and permits alignment tolerances compatible with cost-efficient passive assembly techniques. 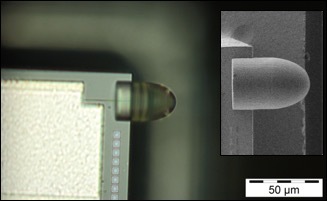 We demonstrate a selection of beam-shaping elements at chip and fibre facets, achieving coupling efficiencies of up to 88% between edge-emitting lasers and single-mode fibres. We also realize printed free-form mirrors that simultaneously adapt beam shape and propagation direction, and we explore multi-lens systems for beam expansion. The concept paves the way to automated assembly of photonic multi-chip systems with unprecedented performance and versatility. 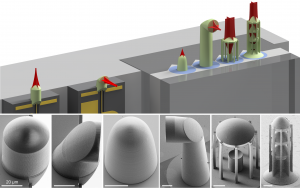 Vanguard Photonics’ collaborators at Karlsruhe Institute of Technology (KIT) have recently published these methods that allow to connect single-mode components using 3D-printed freeform optics in Nature Photonics see https://www.nature.com/articles/s41566-018-0133-4 to find out more. The technology is commercialized by Vanguard Photonics GmbH. Take a look at our web-shop or contact us for further information. Photonic designers are creative folks and continuously come up with new ideas. Why slow this down by long prototyping cycles? We can print a wide variety of customized or custom-designed micro-optical elements such as lensed fibre arrays, micro-lenses and free-form elements with sub-micrometer accuracy – on chip surfaces, laser facets, and optical fibers. Vanguard Photonics’ proprietary photonic wire bonding technology exploits two-photon laser lithography for in-situ fabrication of free-form waveguides that connect photonic chips on a package level. Also, we can print high-precision micro-lenses and free-form elements basically everywhere – on chip surfaces, laser facets, and optical fibers.